Ideophone (Idéophone) [Ideophon] A vivid representation of an idea in sound. A word, often onomatopoeic, which describes a predicate, qualificative or adverb in respect to manner, colour, sound, smell, action, state or intensity. Samarin, in his excellent overview of ideophony in Bantu, carefully notes that ‘[i]t is reported that Doke also is responsible for creating the term ideophone, but I have not come across supporting evidence. Its first appearance seems to be in 19531 with the publication of his Bantu Linguistic Terminology.’ (Samarin 1971:132). Indeed, examples of studies crediting Doke with inventing the term are easily found; here are just a few invoking Doke’s definition2 [relegated to a footnote to save space]. Thus, for Scripture, an ideophone is a unit of sound that is perceived as a holistic whole rather than as a combination of some parts; and this holistic whole represents one idea. This is a very psycholinguistic notion, implying some theory of language processing and comprehension. Scripture’s thoughts on this must have gained currency, for a few years later we find the term ‘ideophone’ included in the 1909 supplement to the famous Century Dictionary. 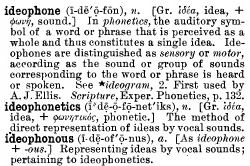 In that definition (shown to the right), we can already identify the seeds of Doke’s usage of the term; and the two derived forms given are even more suitable: “ideophonetics, the method of direct representation of ideas by vocal sounds; ideophonous, representing ideas by vocal sounds…” (Cent. Dict., Suppl. p. 623). But it’s not the representation of ideas! 1909. ideophone. Century Dictionary, Supplement:623. 1989. ideo-. Oxford English Dictionary, 2nd ed. Alexandre, Pierre. 1966. Préliminaire à une présentation des idéophones Bulu. In Neue Afrikanische Studien, Hamburger Beiträge zur Afrika-Kunde, 9-28, Hamburg: Deutsches Institut für Afrika-Forschung. Fordyce, James F. 1983. The Ideophone as a phonosemantic class: the case of Yoruba. In Current Approaches to African Linguistics, Ed. Ivan R Dihoff, 263-278, Dordrecht: Foris. Geurts, Kathryn Linn, and Elvis Gershon Adikah. 2006. Enduring and endearing feelings and the transformation of material culture in West Africa. In Sensible Objects: Colonialism, Museums and Material Culture, Eds. Elizabeth Edwards, Chris Gosden, and Ruth Phillips, 35-60, Oxford: Berg. Schiller, J. Ch. Fr. v. 1900. The Phonetic Text of Wilhelm Tell. Ed. George Hempl. New York: Hinds and Noble. Nuckolls, Janis B. 1999. The Case for Sound Symbolism. Annual Review of Anthropology 28:225-252. Scripture, Edward Wheeler. 1902. The Elements of Experimental Phonetics. C. Scribner’s Sons. Tedlock, D. 1999. Ideophone. Journal of Linguistic Anthropology 9, no. 1-2:118-120. Voeltz, F. K. Erhard, and Christa Kilian-Hatz, eds. 2001. Ideophones. Amsterdam: John Benjamins. von Staden, Paul M. S. 1977. Some remarks on ideophones in Zulu. African Studies 36, no. 2:195 – 224. ‘If Bantu languages have a class of words that deserves a name, this class must surely be identified on formal grounds. (…) I believe that Bantu ideophones can indeed be so characterized, but most writers have been content to quote Doke’s definition of them rather than justify their classification.’ (Samarin 1971:133). This entry was posted in African languages, Ideophones by mark. Bookmark the permalink. The OED is citing a printed card announcing two of the London Dialectical Society’s November meetings, mailed by Ellis to James Murray (they were friends), and subsequently deposited by Murray in the OED archives. We’ll be clarifying our bibliography to show that this is not a published item. Thanks! Do you happen to have access to that card? I’d be interested to hear more about the context in which Ellis used the term ideophone. Wouldn’t this definition mean that every language has ideophones? It would be hard to imagine a language that does not express statements strongly through evocative imagery – I suggest the use of swears and vulgarities in english is quite often ideophonous. They employ anatomical and sexual terms which they don’t mean literally in order to evoke a force of emotion or shock which is non-representational. It makes me wonder how expressives/ideophones are seen socially in the African cultures you have cited thus far? are they considered vulgar or unwholesome in some way? Taking that perspective, I think it is very significant that so many languages of the world have somehow lexicalized expressivity in such a systematic way (a little more on that here, under ‘Why study expressive vocabulary?’). But certainly, your English examples fall under the expressive use of language. Christopher Potts has an NSF funded project on exactly those issues in English, and there are some interesting parallels to be drawn between English expressive vocabulary and expressives/ideophones in languages such as I have been highlighting here. As for your second question, no, ideophones are not at all seen as vulgar (they do make for very effective insults, but that’s only a secondary function, and one of minor importance in those languages I’ve worked with; I do have some interesting data on that). To the contrary: being able to use ideophones is often a sign of eloquency, and as such highly valued. There are vulgar ideophones, of course; but the Siwu ideophones I’ve gathered so far cover a much wider spectrum than swear words and the like in English. And the same holds for collections of Ewe, Yoruba, Somali, Gbaya, Gbeya, ChiTumbuka, Korean, Mandarin, and Semai ideophones I’ve looked at. Anyway, great questions. I’ll be addressing these issues at more length in future postings. it is very intesting topic and i wish to do something on ideophones:the question is, why was it thought that doke coined the term while there are evidences which show otherwise?again where can i get the literature on the topic?but,why this area is not well known so far? MY ARGUMENTS:ideophones indicate some behaviours of lexical words,why scholars put them in a group of its own?why not inserting them into various groups of which they fit syntactically?if an ideophone shows a verb property then put it there. i have observed also that,ideophones can be lexicalised upon frequent uses,if this is the case,then it not fair making them a group of its own,whwt do you say?